Just when you thought we couldn’t get any lazier, General Motors introduces its Buick Rainsense automatic wipers. These wipers are—you guessed it—automatic, meaning that they will keep your windshield clear without your having to move a muscle. Vehicles such as the Buick Encore can be equipped with Buick Rainsense automatic wipers, which use a rain sensor positioned behind the rearview mirror to detect rain or water on the windshield. The sensor, only the size of a wristwatch, detects water via light refraction using infrared light beams. When water is detected, the sensor sends a signal to the computer of the vehicle, which triggers the wipers. Before you think, “Hey, I’m an alert driver, I don’t need this technology to detect rain for me,” do note that the wiper technology takes a reading once every 40 milliseconds, which is probably just a bit more often (okay, a lot more often) than the average driver does. 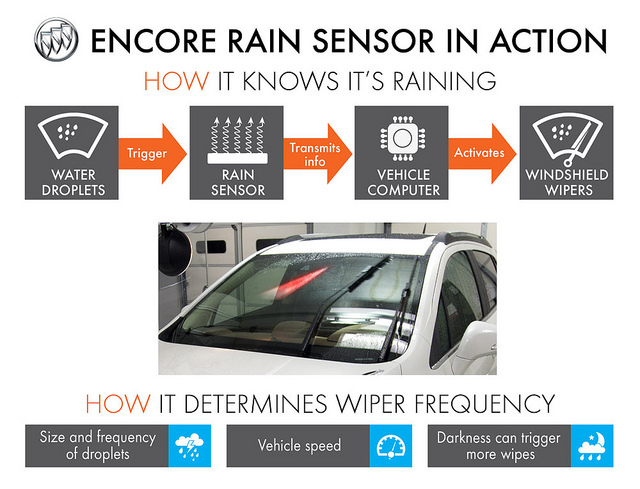 The sensor even measures both droplet size and frequency to determine how fast the wipers need to move. The speed of the vehicle also factors in to the wipe frequency.